It’s long been known that Valve, the creators of the iconic Left 4 Dead series, have a bit of an issue when it comes to creating a third title of their exciting series’. Left 4 Dead, Half Life and Portal all sit with just two main entries in each of their respective franchises, but whilst many of us have sat pondering what another epic Left 4 Dead title would be like, the guys over at Holospark have decided to take the idea one step further. In fact, they are showing us what it would be like to have another epic four-player Left 4 Dead style experience to enjoy, but instead of zombies, it’s time to welcome aliens into the mix. And instead of Left 4 Dead, it’s time to experience the wonders of Earthfall. 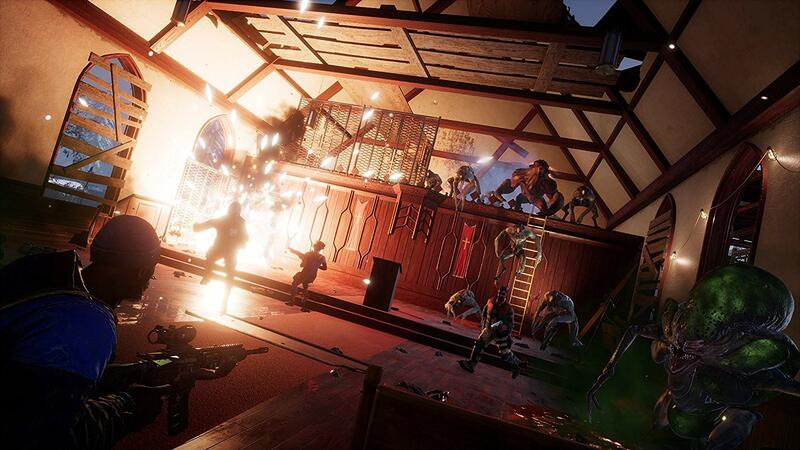 Out of every similarity I’ve ever seen when playing a game, none are quite as obvious as Earthfall’s similarities to the Left 4 Dead series. From the off, players have the option of diving into any of the ten missions currently available in the game, all of which are spread throughout two Campaigns. As you can probably guess that means five missions in each of the Invasive Species Campaign and the Natural Selection Campaign. Each of these missions can be played in Solo with three accompanying A.I. bots, or you can jump online with up to three other players, with bots filling in the gaps for those unable to fill the squad. As far as the story goes, Earthfall isn’t the deepest narrative experience, but it’s not entirely bad either. The tale goes that a huge meteor strike has brought down humanity and life as we know it, as well as providing the guiding path to a host of invading aliens who have now overrun Earth. With four everyday survivors bunched together, it’s going to take a lot of guns, guts and shooting aliens to survive the onslaught. Now I’ve already mentioned Left 4 Dead a fair bit during this review, but when it comes to the gameplay, there really is very little difference in what you’ll find here. From the way players are revived, to the way hordes of aliens run at you, and even the appearance of swarms as you complete specific story progressive tasks such as opening a door to the next area or turning on the power to a necessary bit of kit, it is all very familiar. The biggest likeness however comes down to the enemy types. Beside your usual alien drones that come at you all the time, there are also a number of special enemy types, with the Sapper, Enrager, Thresher, Whiplash, Beast and Blackout all present and ready to ruin your chances of survival. For Left 4 Dead aficionados many of these share the uncanny resemblance to the special infected foes we saw all those years ago. The Beast is essentially the Tank and is capable of destroying your entire team if not dealt with quickly, the Whiplash is the Jockey and jumps onto the player’s head before running away from the rest of the group, the Sapper is the equivalent of the Boomer and explodes when up close before releasing a toxic gas, and the Thresher is pretty much the Hunter and will pin you down before scraping its massive claws at you until you die… or it’s killed by the other players. 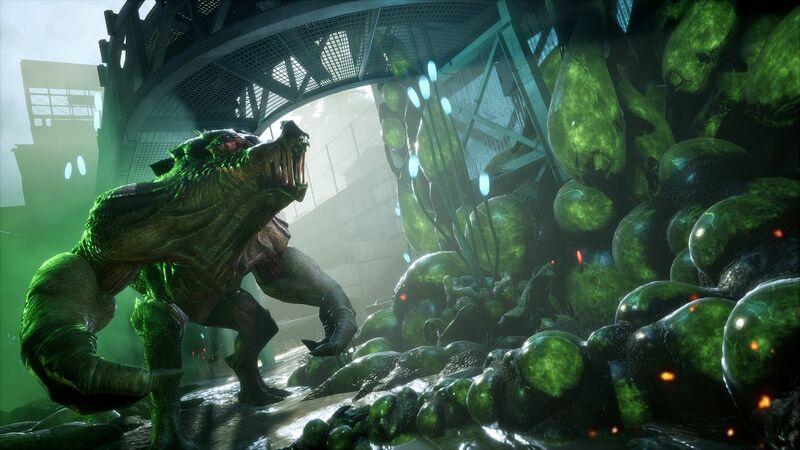 As for the Blackout and the Enrager, thankfully these are different to what we’ve seen before, however, only the Blackout is really worth worrying about it seems, as this creature is capable of attacking the player whilst teleporting to different locations. The fact that is has its own shield that must be taken down before it can be attacked, just increases the difficulty. As for the Enrager? Well, these guys beef up anyone around them, so it’s always an idea to take them down first. They don’t prove too much of a hassle if truth be told, but then the harder difficulties might be entirely different of course… given I failed to get past the first level on anything other than Easy or Regular, it’s hard to say. That difficulty is an interesting subject with Earthfall. There are four to choose from, with the mentioned Easy and Regular joined by the incredibly understated Intense and Overwhelming options, but what is quite interesting is that should you be playing with bots in your team, you can also choose their difficulty, or ability rather; Newbie, Average, Skilled or Masterful. For me Masterful seemed like the best way to go to ensure I made it to the end, whilst Newbie seems rather pointless, and it would have been nice to see an option to turn them off all together. Nevertheless, the chance to at least choose how useful the A.I. counterparts are when in battle is a nice one to have. That said, don’t expect an easy ride by upping the A.I. as jumping straight into Overwhelming with Masterful A.I. won’t see your chances increase very much. Maybe wait until you’ve mastered those necessary terminator style abilities first before attempting that one, yeah? Back to the gameplay though and the game plays, looks and feels identical to that of Left 4 Dead, however that’s not a bad thing. Each mission comes with small yet believable objectives that feel realistic to the scenario, gunplay is smooth and feels great when aiming down the sights, and the visuals are incredibly satisfying whether you get to see the pop of an alien’s head as you land that perfect headshot, or if you are running through the confines of a junkyard to get a battery for the vehicle you so desperately need. 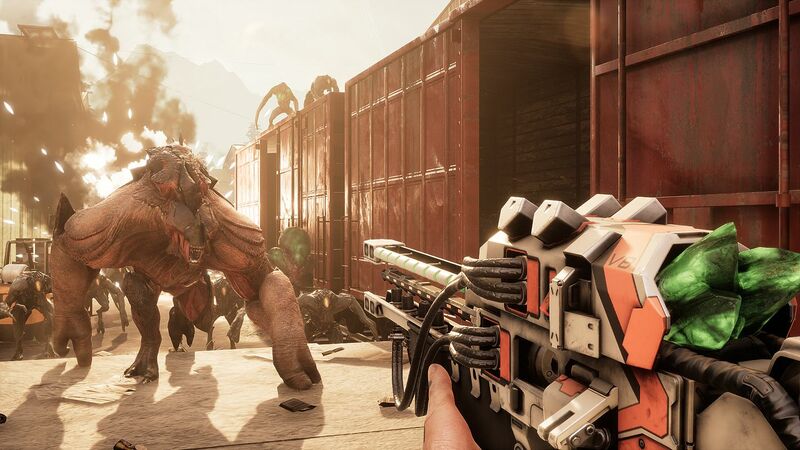 There is one mechanic that is entirely original with Earthfall however, and it’s one that makes finding your favourite weapon more possible – 3D printing. Much like the electronic Healing Stations that can be found in certain locations – usually one that is about to overrun by a huge swarm – 3D Printers allow players to print a weapon from two options available, with those choices changing at different printers. The weapons don’t come with a printing limit either so running out of ammo isn’t really an issue as you can simply print another, although with a five second limit on some weapons, you’ll need to make every bullet count unless you want to be overrun… five seconds is a long time to wait when a Beast is smashing down your barricades. The likeness to Left 4 Dead is sure to have many enjoying this alien invasion, but the length of the experience is certainly an issue. Whilst there are ten unique levels to enjoy, each mission only takes 20 minutes or so to complete, so it’s only really three hours at most you’ll need to play everything the game has to offer. Obviously the replayability factor is there thanks to the game giving random enemy placement, and it’s a joy to play with friends, but there is no denying the calling for more levels or Campaigns to be added. Fortunately, there is nothing to say we won’t receive them in the future, but at present the short game time makes the price feel a little too steep. One other issue that presents itself stems from the main menu customisation option and the fact that there are amendments available that should allow for players to customise weapons and character outfits. However even after having completed every level of the game, there is still no option available at present, which begs the question as to why it was even included to begin with. 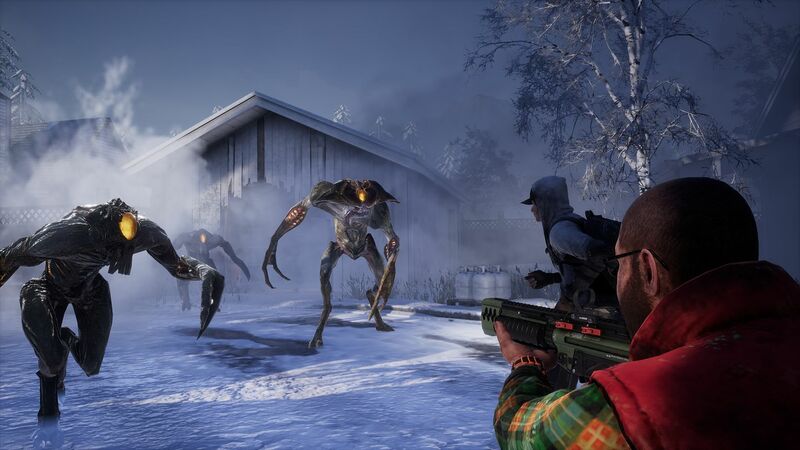 Overall and whilst Earthfall is looking to carve an identity of its own and bring the alien invasion to our screens once more, it’s impossible not to compare it with the Left 4 Dead series. On a positive though, those wishing for a new Left 4 Dead title will find plenty of fun to be had with this addictive shooter and with a few more campaigns added to increase the longevity of the game, this is easily a title that many will want to head back to time and time again… even if it’s just to try and complete the insurmountable task of the Overwhelming difficulty. The Left 4 Dead game we never got!